There will always be a demand for big whites. As long as there are weddings, funerals and events, white peonies will be there to steal the show. Capital Dome is such a white giant. She has the overwhelming quality of the so-called bomb shape. Capital Dome is a huge white ball and she's ready to rock your day. Since 2018 we have had limited amounts of her in our assortment. Capital Dome was created by Myron Bigger. He registered her in 1978. 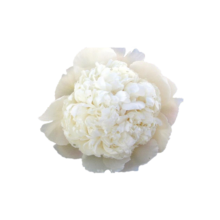 My Peony Society offers even more white, bomb-shaped peonies: Bridal Shower and Colonel Owen Cousins for example.